Google announced a 7-inch Android tablet at its I/O developer event at the end of June 2012. The Google Nexus 7 is built by Asus and includes a quad-core Tegra 3 processor, a 12-core GPU and 1GB of RAM. The device has a 1280 by 800 screen and a battery life of nine hours. Two versions are be available, with 8GB and 16GB of storage, retailing at US$199 and $249 respectively. The tablet incorporates an NXP PN65 NFC controller with an embedded secure element and can run Google Wallet, the search giant’s NFC payment app. 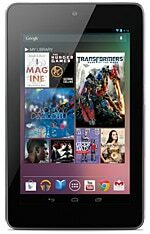 The Nexus 7, the first device to run Android 4.1 ‘Jelly Bean’, is now no longer available and has been replaced by the Google Nexus 7 (2013).